Informal settee with a simple, elegant design, it can be used as a regular settee or as a comfortable sleeper, ideal to be placed in the middle of the room, as it can be used on both sides. A soft feather-filled backrest is also available to satisfy personal comfort requirements. 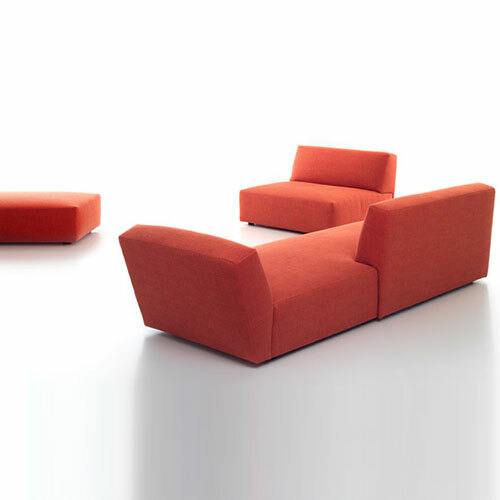 The collection is completed by an element without armrests and a comfortable pouf. The covers are completely removable. Itaca can be equipped with the small table Argo. Frame in solid wood and plywood sprung with interwoven elastic bands. Feet in black-stained beech. The covers are completely removable. Itaca can be equipped with the small table Argo. Armrests, backrests, and seats are padded with different density polyurethane. Designed and handmade in Italy.